Meet Charlie Glaize who brought my characters to life. Audiobooks are available at audible.com, amazon.com and iTunes. Charlie Glaize is a graduate of The University of Florida with a degree in Broadcast Journalism. However, it was from an elective oral interpretation class that he received campus-wide accolades for not only his story-telling skills, but also for the diverse character voices provided as the narrator for a university recording of Dr Seuss’s “Horton Hatches the Egg”. Charlie’s career path was then set for becoming a voice actor. College was followed by experience as a writer/producer at a Florida ad agency, then as a radio and TV announcer, which led to full-time work in voiceovers. Charlie is noted for being the national spokesman for CIRCUIT CITY, during the company’s 10-year reign as America’s largest retailer of consumer electronics. 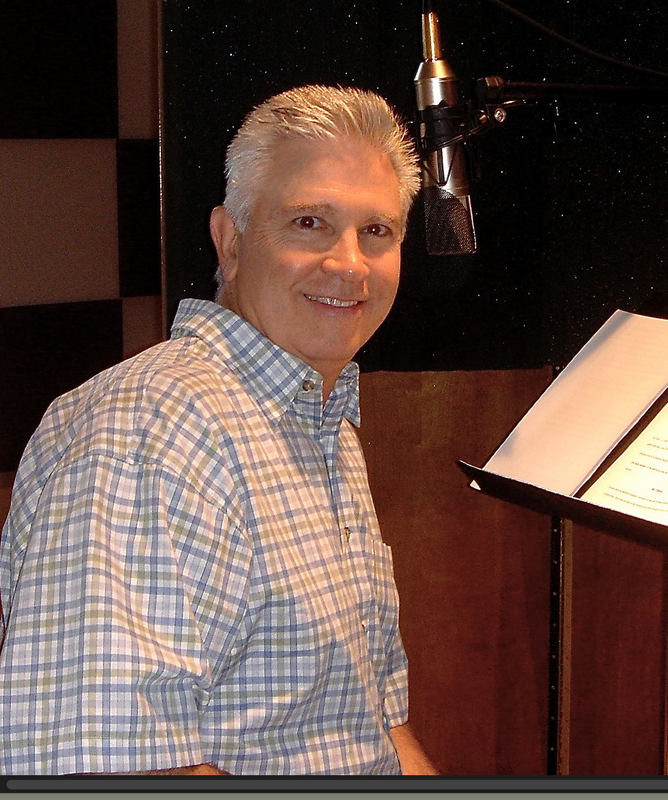 He has been a primary promo voice for The Family Channel, and has provided voiceovers for McDonalds, Visa Gold, Cici’s Pizza, and Ben Hogan Golf Clubs, among hundreds of other commercials. Charlie has voiced several programs on The Travel Channel, also narrated The Discovery Channel’s” Daring Capers” and videos for various museums as well as for The Mount Rushmore Foundation. In the world of audio books Charlie has recorded a succession of inspirational releases, both fiction and non-fiction. This includes Christian classic novels, “In His Steps” by Charles Sheldon “A Time To Weep” by novelist Gilbert Morris, “The Secret of Obed Edom by Daniel King, and in non-fiction: “The Practice of the Presence of God” by Brother Lawrence and “Religion of Peace” by Robert Spencer .To top things off in the inspirational realm, he was privileged to be the voice of God in Zondervan Publishers Children’s Bible. Most recently, Charlie’s voice has ventured effectively into the mystery genre, with the release of the audio version of author Marilyn Dalla Valle’s suspenseful “Murder in Newport”. Charlie is happily married, enjoys golf and vacationing in Hawaii and California, has two grown sons, and lives with his wife Carole and spoiled rat terrier near the coast of Virginia Beach, Virginia. I was introduced to the man behind Mario’s voice by my 7- and 5-year old grandsons and I told them about you. We looked you up online and the two boys also searched on their tablets. They were impressed. The oldest wants to be a You-Tuber, so he is investigating types of peofessions. Maybe he can take a path similar to yours. I hope to find some time to get to your area this fall to visit.